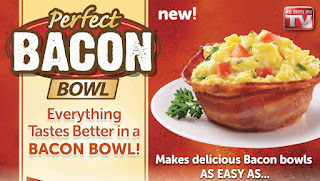 What do you think of this Perfect Bacon Bowl? This little thing will help you make the perfect bacon bowl to fill with... well, everything goes great with bacon! Wrap bacon around the bowl and cook in oven, toaster oven, or microwave. Also makes bread bowls for soup, stew, and more. BONUS QUESTION! Who has the best price? Today it is definitely the US Amazon site at 87% off!